Speculation about Apple's 'to do' list for 2014 has fired up again, after a leaked memo sent by Tim Cook to Apple employees dropped a teaser for some "big plans" set to take place next year. "We have a lot to look forward to in 2014, including some big plans that we think customers are going to love," read the email obtained by 9to5mac. Well what did you expect? "Sup guys, think we're gonna have a chill one in 2014. Might put out a new iPhone in September or something. We don't think customers will like this one at all." 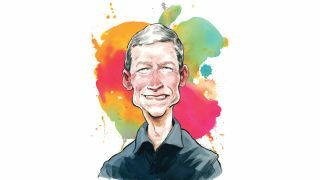 But then, admittedly, "big plans" does sound bigger than just another iPhone, a new iPad and an updated range of iMacs. 2014 is believed to be the year of the fabled iWatch, Apple's fitness-based smartwatch, which could be what Cook is sneakily referring to right here. Then there's iTV, the television set Apple is believed to be developing. Legend once told of a 2014 release date for that too, but more recent murmurings suggest that Apple has put all that on hold so it can keep its focus on the iWatch for the time being. Or, Apple could be taking bigger in the literal sense, with a larger iPad Pro and 6-inch-screen iPhone 6 possibly in the works too. It could even be that we see all of these things come true next year, in which case Cook's probably understating things a little, if we're honest. For now though, the one we'd feel safest putting money on is the is the iWatch. But who knows? Apple might actually find a way of surprising us again with something completely unexpected.